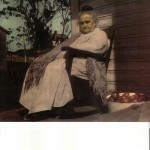 The early color photograph of my great-great grandmother Susan Ethel Fleming Moon (b. 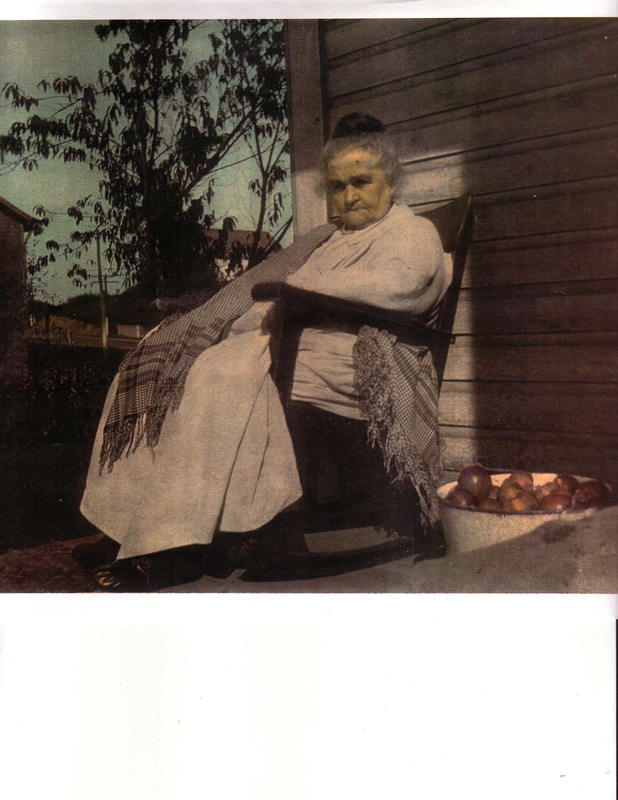 1846) sitting in her rocking chair on the front porch of the condemned North Park farmhouse has become almost iconic in our family. 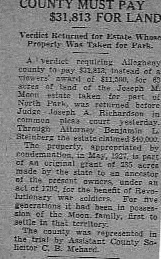 Susan Fleming Moon had come to northern Allegheny County, PA, in 1881. Grandma died half a century later, just four years after the County leveled the structure during the 1927 public domain takeover of the property, which had been farmed continuously by the family since the arrival of Henry Moon in 1796. 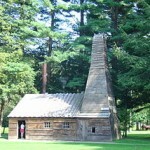 It had been part of Pennsylvania’s post-Revolutionary War Depreciation Lands. Susan’s husband Joseph Myler Moon, Jr. (b.1835), Henry’s grandson, had met her while off working the booming oil fields of Venango and surrounding counties sometime after the first gusher there in 1859. They were married in Titusville 1864. This article is devoted to Susan’s family, the Flemings of Sugarcreek and Jackson Townships. Unfortunately, at this time, we have been unable to connect them with the better documented Flemings of Oil Creek. We’ll learn more about that family, which had come north from Fayette County in 1796, in another article. Our Flemings had come to Sugarcreek from Cumberland County sometime after the marriage of Susan’s grandfather Lawrence Carlysle Fleming (b.1784) to Margaret Cooper (b.1787), all part of the great pioneering push westward in the early 19th century. In addition to presenting the meaning of our surname, we’ll consider some of the more famous Flemings in history and some not so famous from both sides of the Atlantic. “Flaminius” was a popular family name in Italy before Christ. Caius was a Roman consul and Quintius was the general who defeated Philip of Macedon (197 BC). Before that, the Latin root “Flamma,” meaning a flame or blaze, was part of the name of the tribe of Flaminians, known for their love of civil and religious freedom. Julius Caesar conquered western Europe in 50 BC, and probably rewarded some of his generals with land. The name of the geographical region called “Flanders,” in the northwestern part of Belgium including part of the Netherlands, comes from the French “Flamands” and German “Vlaminger,” which was shortened to “Fla’nders.” Thus, we believe that our ancestors settled in what was known as “Belgia” (70 AD) as the Flemish and their descendants still carry this identifier today. The Flemish of Europe even have their own language, a sign of dominance and permanence within a region. Linguists say that the dialect contains parts Latin, French, Scandinavian, German, and Celtic, from which the Anglo-Saxon or Old English came. From 845 until 1830 the region was fought over and found itself in various hands: France, Germany, Spain, Holland, and even Austria. Today Flanders is part of Belgium. Yet the Flemish had a natural affiliation to Scotland, the land from which our 17th century Scots-Irish originated. Historians believe that emigration began even before religious persecution began with the Protestant Reformation (1517). For example, the daughter of an Earl of Flanders married Alexander III, the King of Scotland, in 1280, and surely the Earl’s subjects were welcome across the North Sea. * Margaret — there are several, including a Titanic survivor, the title of the world’s first “modern drama,” and more. Read about other famous Flemings on the Fleming Surname Page. Little is known with certainty of our family history before the marriage of Lawrence Carlysle Fleming and Margaret Cooper in 1807. Some believe that his father was Jacob B. Fleming (b. 1744), and recent Ancestry.com Public Member Family Trees and documents seem to confirm that. In fact, we think that Jacob’s wife was Sarah West (b.1750) and that they had seven children in Shrewsbury, Monmouth County, NJ, before her early demise at age 39. Fleming family researcher Tom Robershaw bases his theory of Jacob B. being Lawrence’s father after the fact that Lawrence and Margaret named their sixth of seventeen children Jacob Budman Fleming (b.1819). 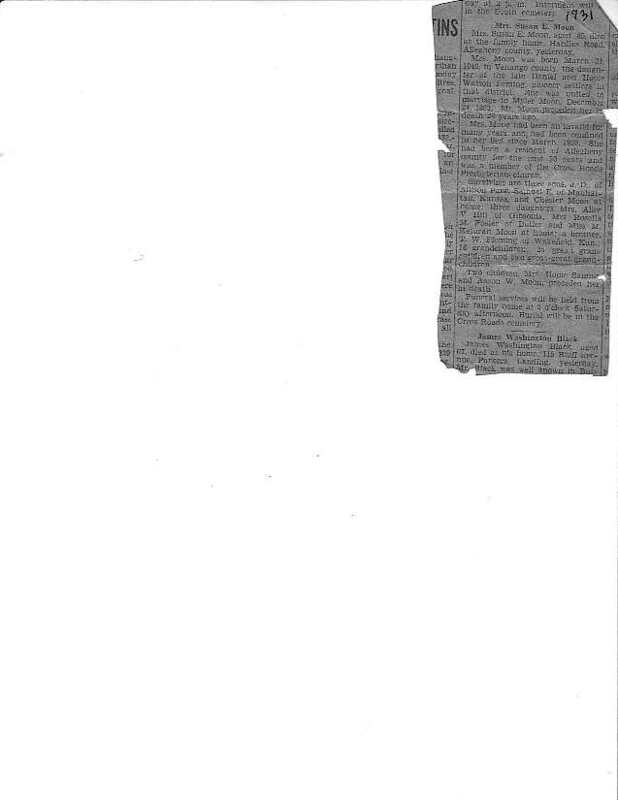 Apparently, the Budmans had been friends of the Flemings, either in New Jersey where both Lawrence and Margaret were born, or in Cumberland County, PA, where they lived before the move to Venango County. Incidentally, Lawrence’s father-in-law John Cooper is found next door in the Cumberland census reports. Our research continues. Lawrence and Margaret’s second child, our Daniel Cooper Fleming, was born in 1810 but we’re not sure where. He is listed in the 1820 census for the new Columbia County, PA. It had been formed from Northumberland seven years earlier. By 1830, fifteenth child Lawrence, Jr. was born in Centre County. Then, in the 1840 census, Lawrence and Margaret are found in Sugarcreek, an original 1800 Venango County township. Again, confusion sets in with historians because our Flemings are listed in both Sugarcreek and Jackson Townships. The later wasn’t formed until 1845, so county history books list the family in both. 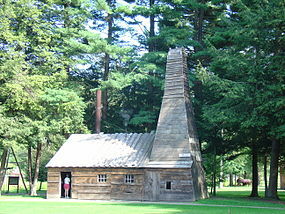 According to The Oil Creek Flemings, that other Fleming family of Venango County was first to arrive, in 1796. But, the source continues, “By the mid-1830s another large Fleming family, the ‘Sugarcreek Flemings,’ with no known connections to our Flemings, were in the central part of Venango.” What brought these and other families to such a remote part of Pennsylvania? Was it the cheap farmland? We don’t know. But, about twenty years after our Flemings arrived, a natural oil flow was discovered. This was about a half decade before the first successful well, drilled by a Yale University chemist and former railroad conductor. The County website claims that output from that single well exceeded the total cumulative output of all of Europe since the 1650s. It wasn’t long before well began springing up all over the region, getting the attention of big business. The modern day conglomerates such as Pennzoil and Quaker State quickly grew by buying out the small companies of “wildcatters.” Not unlike the 1849 gold rush at Sutter’s Mill, CA, the promise of lucrative jobs and even instant wealth drew men (and women) from every direction. For every story of lawlessness and primitive infrastructure are tales of families, like our Flemings. holding together and settling in. Unfortunately, as the oil reserves diminished, the men and the Big Oil moved to new, more productive fields, such as in Texas. Ironically, with the price of oil skyrocketing today, and Venango County’s remaining oil reserves estimated at 70% of their original, though more difficult to obtain, interest is being expressed in new extraction methods. One Canadian firm has proposed using abandoned mines as platforms to reach and store the oil. Only time will tell if that scheme will be worked. I have been trying to think of cousin Joseph [Sr.(b.1795)–Susan’s father-in-law]. I remember of him going to the oil field with my father [Nathan E. Davis (b.1812) was Joseph, Sr’s brother-in-law, having married his sister, Sarah Jane.] and then he came down once after supplies [Apparently the Moons and Davises lived near each other in Allegheny County.] but the most I remember was that our little boys’ ambition was to be as tall as cousin Joe. Zella – 7, Joe Dan – 9, Hopie S. – 13, and my great-frandmother Alice “Allie” Virginia – 15. 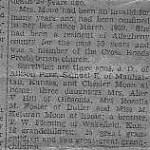 According to Grandma Susan’s obituary in 1931, she and Grandpa Joe returned to the Moon farm in Allegheny county permanently in 1881 with several children in tow. His father had just died, but we don’t know when and if he also had returned earlier or just who was maintaining the property. Joseph Jr. would have been 46 years old then, still young enough to farm. Susan was only 35 and still in her childbearing years. My great-grandmother Alice was only 16 and, I’m sure, a big help to her parents. Susan lived another half a century, a period that saw tremendous technological change, perhaps none greater than the coming of the car and its need for petroleum products. Surely our Flemings in general, and Susan in particular, represent the change in America from rural life to urban, from farm to automobile. Susan and Joseph are buried at the Cross Roads Cemetery in Pine Township, Allegheny County, very near to their family farm, but many of our Venango County Flemings are buried in the beautiful Forest Chapel Cemetery. (See “Photo Album: Fleming” and interments under “Table of Contents.”) They have returned to the ground that drew so many early pioneers to that remote, yet pristine spot in the first place, just above the “black gold” that would thrust that peaceful valley onto the world stage. Little did they know of the changes that would “drill” Venango County into the history books. Later, as other places and other reasons lured our family away, those persons and those times faced other changes. I can still see Great-grandmother Susan Fleming Moon rocking away on the porch of that old wood frame farmhouse where North Park now sprawls amid the hills and valleys of Northern Allegheny County. Her shawl gently draped around her shoulders, she seems to be waiting for change—picnic pavilions to replace cattle stalls, softball fields to replace hay fields, and squealing children to replace clucking chickens, and yes, her own demise. As new generations are born to fill our space, perhaps in the name of progress but certainly in the spirit of inevitability, we like Susan can look forward to a great family reunion one day. With so many of our loved ones so far away now, what a change that will be! Fleming, Rev. Samuel. A Record of the Family & Descendants of Robert Fleming. Coldwater, MI: Republican Job Printing, 1868. (Available through the Ft. Wayne, IN, County Library; also available through Google Books and the PA Archives online). Enjoyed reading about the Flemings. We have Fleming Y and Mt DNA projects happening at http://www.dna.ancestry.com (search for Fleming) over 300 members now from around the world. It is a fascinating project and is matching up branches of the family that have been previously lost to each other due to migration to the colonies. Thanks for the information. I’m sure you’ll have some responses from various Flemings.